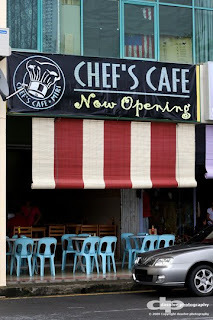 Operated by one of the friendly MC net member (nasilemak_jr), this shop offers halal food with its class. With his rich experience in cooking learnt from the West and bring it back to the East, he wants to share something new and tasty to his fellow Mirians and those in Miri of course. 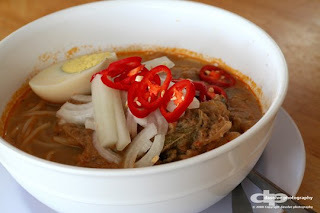 One of his specialty served in this cafe is the Penang Laksa! The best thing about this laksa is that not much oil! 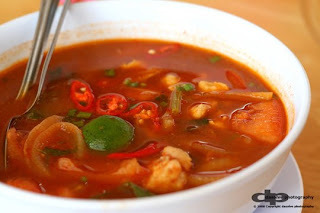 It is definitely a nightmare for people who are in strict diet especially girls if the laksa is oily. The smell is great and tempting indeed! With its think stock to mix with the noodle, it is without any doubt a tasty meal that is too good to be missed! Another meal which i found it very tempting is their nasi lemak. Look at the photo, it is enough to make your saliva just keep dripping! It is served with chicken, cucumbers, freshly roasted peanuts, crunchy local anchovies, sweet and spicy paste at the side and not to forget the pan-fried egg on top of the rice with coconut fragrance! Order one when you are there! 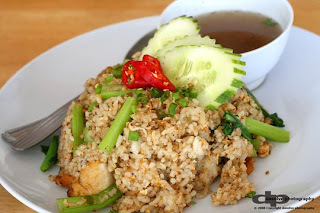 Here comes the Nasi Goreng Kampung! Fried rice with lots of ingredients! They mixed it with chicken breast meat as some of the shops did it with local anchovies. When you eat it, every spoonful give you the fantastic flavour which makes you feel satisfactory. It served with a bowl of soup to smoothen your throat. Great combination indeed. If you think they only serve Malay food, you are wrong! It goes international! 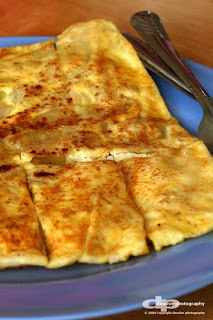 Here comes............. Roti Telur! Comes with a small serve f paste which is cooked with chick peas and with little sour and spice flavour on it. It goes well with the Roti telur and make you wants more! Oh i forgot to explain what is Roti telur. It is actually made of flour which is originated from India where they "swing" the flour until it turns a very thin layer of skin, then they break an egg in between before folding it into a square or rectangular shape. From India all the way to Thailand! Those who like hot and spicy, here you go! Tom Yam Noodles! Enjoy the sour and spicy sensation with full of noodles, chicken meat, onions, lime, tomato and more! That's not all they have. Stay tuned as there are more surprises for you all! oh ya!~forgot jor~i also got try the nasi goreng biasa order by ian wife and tomyam mihun order by Saf.Well, the nasi goreng not bad :) but i like chinese nasi goreng more...hehehe..the tomyam!Really spicy la...but the colour of soup very attract..nice colour!~if u like tomyam..spicy one!u can try..but Saf said add more sour will be better..
Hey, where is this Chef's Cafe? The signboard is gone and the shop is not there anymore. Is it shifted location or closed down? went there last night. The food came out really slow. One at a time. My kolok mee came out first. By the time the honey grilled chicken my husband ordered came, I've already finished my meal. The mango smoothie he ordered was too sweet. He had to add another small glass of water to dilute it. My drink - teh c, like air gula more. sweet and no teh c taste like drinking plain water add on sugar. My food - Penang Laksa, not enough sour and spicy. Really disappointed. The taste totally different like last time. 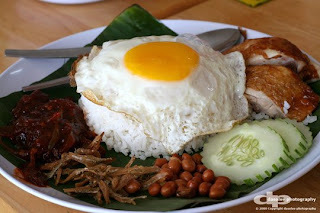 Nasi Lemak - The rice too watery. My mum complain said why the nasi lemak don't have fried chicken, only got egg,ikan bilis, peanuts, and sambal. It's cost RM4. Kampung fried rice - It's a bit salty. 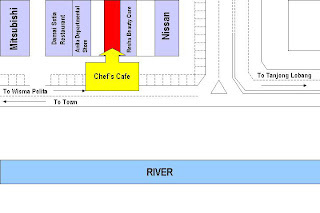 I don't know what's wrong with this chef's cafe. But this really spoil my sunday mood. My mum said she will never wan to come here anymore. But i think i will be come back again, hope next time will got improvement.